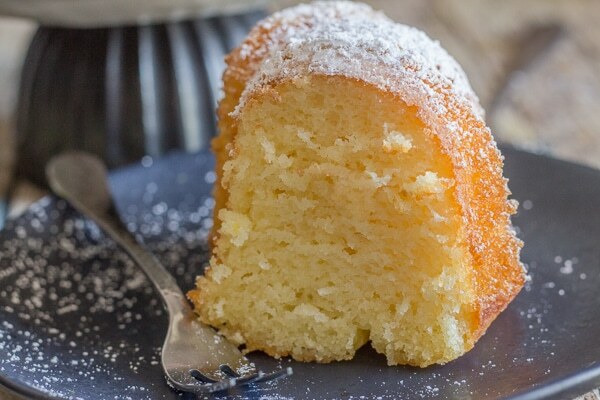 Lemon Cake a delicious moist Italian Cake, and all you need is a tablespoon for measurement. Fast and Easy and so good. The perfect Breakfast, Snack or Dessert Cake Recipe. Give me a tablespoon and I will give you a Cake! A delicious moist Lemon Cake at that. I first tried this cake a little while ago at a friend’s house. To tell the truth it was delicious but a little on the sweet side for me. But that didn’t stop me from asking for the recipe. And as it turned out this was another one of those you-gotta-love “Italian Desserts”. 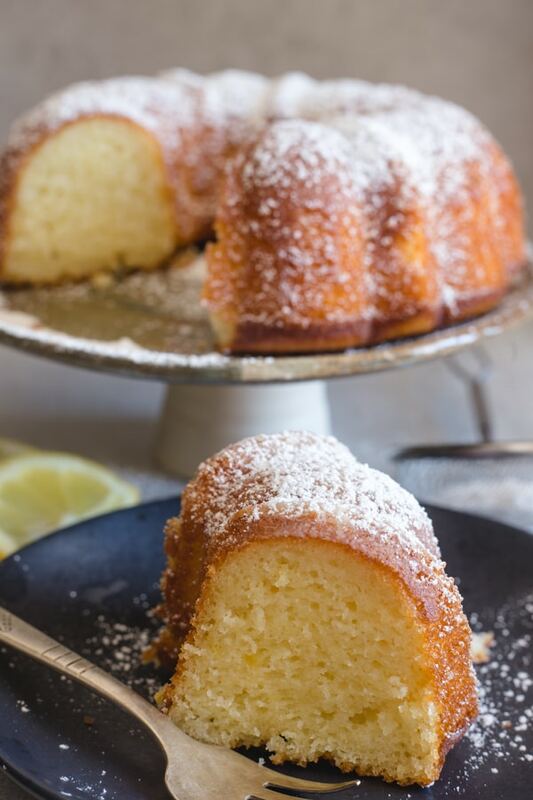 This Tablespoon Lemon Cake was along the same lines as my Easy Yogurt Cake that was given to me in yogurt cup measurements! But this cake is actually called Torta dei 12 Cucchiai / 12 Tablespoon Cake. I actually remade this cake a few times until I got it right, or as the Italian declared now this is a Lemon Cake! And that was to bring a couple of ingredients down to 10 tablespoons instead of 12, and to add a little more of this and a little less of that. And that is why it’s called the “Tablespoon Cake”. 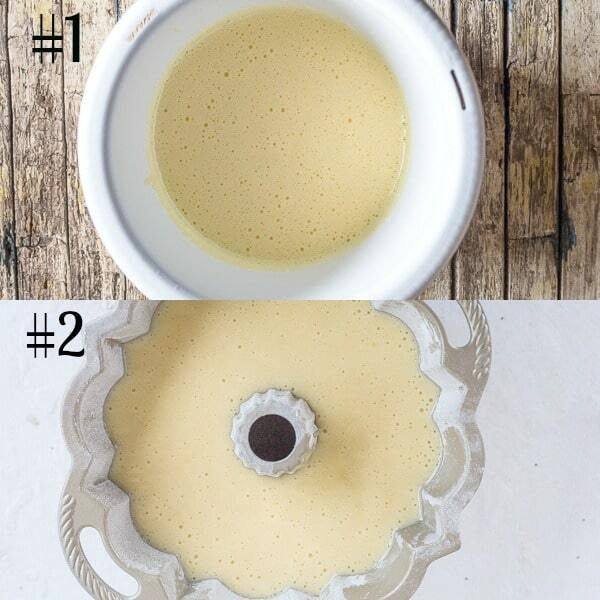 Pour into prepared cake or bundt pan and bake. Simple, Easy and so good! And all you need is a tablespoon! If you have noticed Italians are not big on lots of creams or frostings. A simple dusting of powder sugar is all that is needed on most desserts. Unless of course we are talking about Tiramisu. But again it is not an overly sweet dessert. 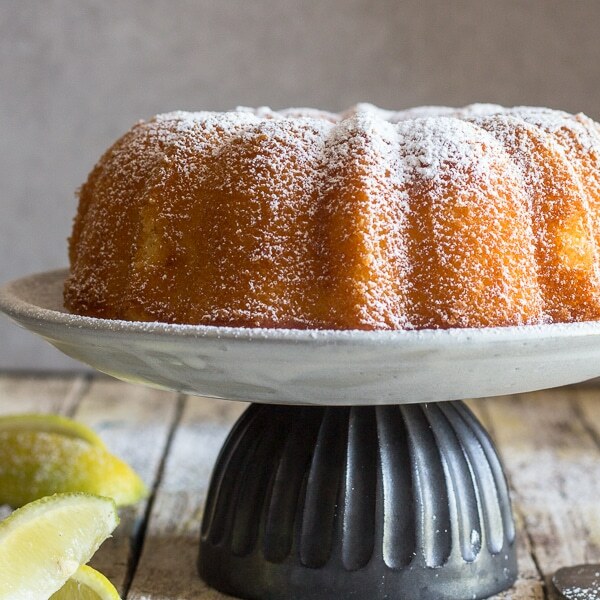 And this cake is also on the smaller size, so a larger than 8 inch cake pan is not going to give you the height that you see in this Lemon Cake. What baking pans can I use for this Cake? An 8 inch (20 cm) round cake pan. A 7 1/2 x 3 inch (19 x 8 cm) bundt pan. (this is the best size for this cake). An 8 x 8 x 1 1/2 inch (20 x 20 x 4 cm) square pan. An 8 1/2 x 4 1/2 x 2 1/2 inch (21 x 11 x 6 cm) Loaf pan. I actually found that the best size for this cake is a 7 1/2 bundt pan, do not go higher than an 8 inch. I decided to make it changing up my beating speed. I started out beating the eggs and sugar on low speed but then turned up to medium high. I continued to beat the ingredients going from medium to medium high. And yes the cake rose and then sank almost immediately once it was out of the oven. I then made the cake again, this time beating the whole time on low speed (speed #1) and the cake came out perfect. So remember beat on low speed, and the eggs and sugar must be beaten at least 5-7 minutes. I use both lemon juice and lemon zest in this recipe. Some insist that the zest has more lemon flavour than the juice. The zest is the oil of the lemon and is therefore filled with the pure lemon flavour. The juice holds the acidic tart taste of the lemon. Just be sure to grate only the yellow part of the lemon and no white part. The white part will add only bitterness. And you don’t want that! So grab your tablespoon and let’s make a Lemon Cake. Enjoy! 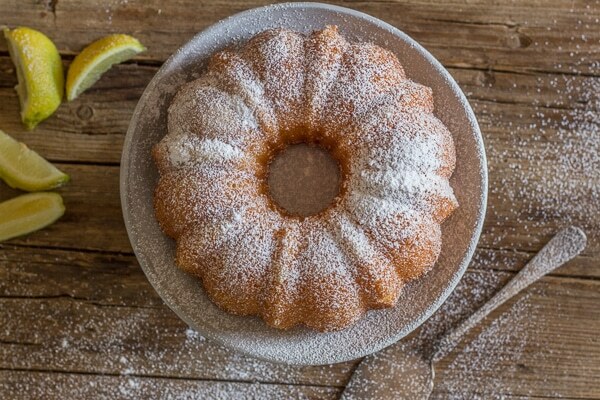 Italian Lemon Cake a delicious moist Cake, and all you need is a tablespoon for measurement. Fast and Easy and so good. The perfect Breakfast, Snack or Dessert Cake Recipe. Pre-heat oven to 350F (180C), grease and flour a 7 inch cake or bundt pan. In a small bowl whisk together the flour and baking powder. In a large bowl beat on low to medium speed (low is best but no higher then medium speed) sugar and eggs until very fluffy and light. Approximately 5 minutes. Then add the zest, juice, oil and milk, beat until combined. Then add the flour mixture and beat on low speed until smooth. Pour into prepared cake pan and bake for approximately 40 minutes or until toothpick comes out clean. Let cool in pan then remove to a cake plate. Let cool completely before dusting with powdered / icing sugar. Enjoy! **All tablespoons (and teaspoon) are level not heaping. Eggs and sugar should be beaten on low speed, never on high speed. When adding the flour mix on low speed. This cake looks beautiful! 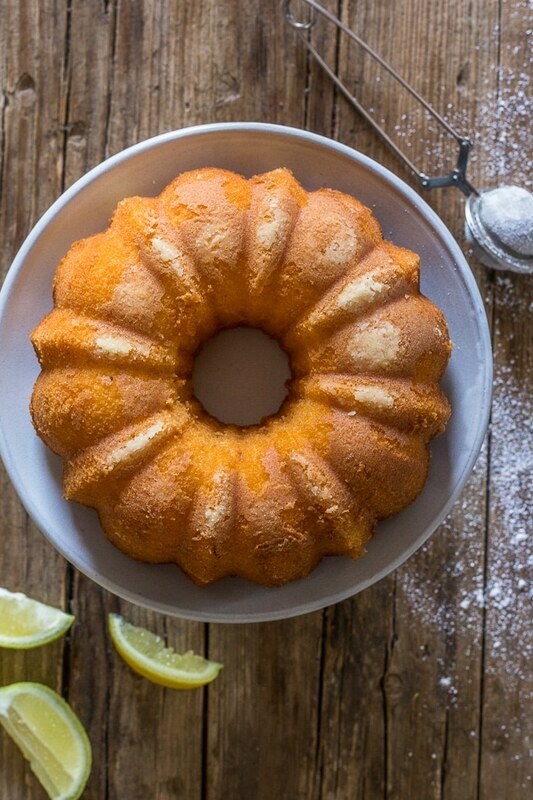 Always love the bright yellow color and zesty flavor of any delicious lemon baked goods. Making a whole recipe using tablespoon measurements is a new one for me but this cake looks so moist and yummy that I’ve got to try it. I made this cake over the weekend. Hubby and I just loved it. In fact I am enjoying a piece with my coffee right now! Hi Beth, thanks so glad you both enjoyed it. Have a great week. I read the whole web page, the comments & all instructions very carefully because I really wanted this cute cake to work! I baked the cake in an 8” round cake pan and it came out perfectly! I love that it’s not too sweet. Thanks for sharing the recipe! I made this lovely cake for the first time and it turned out fabulously! Hi Dolores, so glad you like it 🙂 have a great weekend. Came out really good! Thank you. Hi Rohini, thanks glad you liked it. Happy New Year. The Italian lemon Cake was the easiest fastest cake I saw on the internet. I do not want anything fancy because like all most of us have a busy life. My first baking a cake tonight after I had my prolapse operation for my bladder and backside. It seems no fuss to make this cake. Wish me luck making this cake tonight. P.S. I love ITALIAN CAKE AND FOOD! Thank you for posting. Anything fast and easy, please email me. I even like 1 big roasting pan meals to be placed in the oven. Hello, I LOVED your recipe! it’s wonderful! I did one and a half of the measurements to make it a little biger, (I didn’t have a right size of a pan for it, so I had to improvise rsrsrs) But it turns out just great. It’s my new favorite recipe. Thanks a lot! Hi Maria, thanks so much, I am so glad you like it. Have a wonderful weekend. Hi, I would need to double the recipe but don’t want to have to measure out 20 tablespoons of milk, etc. Do you have a version with cup measurements? Thanks in advance! Hi Shaina well there are 16 tablespoons in a cup so 20 tablespoons would be 1 1/4 cups. Hope that helps. I was so looking forward to making this cake. 5 minutes after I took it out of the oven, it fell down to about 1” high!! What did I do wrong? Mine did, too! Ugh! I made it twice, because I thought I didn’t bake it long enough the first time, and I used a 9” round pan. So, the second time, I changed the oil to canola, used an 8” square, baked it longer, and it still fell flat. Hi Mary, have you gotten a private reply yet? I haven’t. I tried it twice as well, and it fell both times. The second time I used an 8” round cake pan like someone said, and it still fell. Hi Anne, this is so strange, I have a question, how was the weather when you made it? I am trying to figure out why it isn’t working, it works fine when I make it. Do you beat the egg and sugar for 5 minutes? I know for sure a bigger pan is not the answer. Thanks and so sorry it didn’t work. Can I use less sugar and if so, what is the minimum amount of sugar? I want to make this for my toddler’s class part and don’t want kids bouncing off the wall from sugar high. Thanks! HI Germaine I don’t think I would reduce the amount the amount of sugar in this cake because it has to be quite precise. How about the Easy Yogurt Cake instead? https://anitalianinmykitchen.com/easy-yogurt-cake/ I think you could safely reduce the sugar to 1/2 cup. Hope that helps. I made the cake but it was so shallow…Did you use a regular size bundt pan? I felt like there was so little flour compared to the wet ingredients. Only 12 tablespoons of flour?I checked my baking powder and it was good. I wonder what else it could be? Hi Dianne, I actually used a small 7 1/2 inch bundt pan. And yes the ingredients are all correct. So if you use a large pan the cake is going to be quite flat. Hope that helps. I followed recipe exactly but the cake turned out to be one piece custer like from inside not cake. What could i have done wrong? Hi Heba, to tell the truth, I have no idea, I have made this recipe so many times testing it out and even making a video and I really don’t know why it works for some and not all. Maybe you aren’t being the eggs enough, or your stove temperature is off, or the baking powder has expired, or the pan is too big. I guess I would have to come and watch you make it, but unfortunately that is not possible. So sorry I am not a better help. Taste very good , just Same happen on my cake texture with caster inside . Is it because I used foil on top to avoid cake burning that may lower temperature. How can I avoid cake to get burn on top? Hi Joyce, I have no idea why it would burn unless your oven temperature is off. And yes the cake should not be covered while it is baking. Maybe turn the temperature down to 325F. Hope that helps. Hi Joyce, I really don’t know, make sure you melt the butter though. Let me know how it goes. I have just started baking and this recipe was so simple. Even amateur cook like me made it. Tastes really good. Thanks for keeping it so simple! Just the right combination of lemon and sugar! Hi Garima, your welcome, and so glad you started baking and you like the recipe. Thanks so much let me know what you try next. Have a great week. Is it OK to double the recipe? And if so do I need to cook it for longer? Hi Bevin I have never doubled the recipe so I don’t know if it would work, although I think other bakers have. If you are looking for a full size Lemon Cake, than this Italian Fresh Cream Lemon Cake is really good too. https://anitalianinmykitchen.com/italian-fresh-cream-lemon-cake/. Let me know. Hi. Happy to find this recipe. Need a nonpumpkin nobfrosting cake for Thanksgiving and the host is Italian Do you think the recipe can be doubled for a full size Bundt pan? Hi Judy, I personally love this cake but I have never doubled the recipe. And to tell the truth it works every time for me and for most who have made this recipe, but I would hate to see you have problems on Thanksgiving, so I am going to suggest that you try this Lemon Cake instead. Just as good, some including my husband likes it more. 🙂 And it will fill a full size bundt cake. https://anitalianinmykitchen.com/italian-fresh-cream-lemon-cake/ Hope this helps. Let me know. Hi Rosemary! Can I substitute the flour with gluten free flour and if so do I use the same amount? Thank you ! Can’t wait to try this recipe! Hi Cindy, I have never baked with gluten free but as far as I know it’s a one for one substitute. Hope that helps. I have never baked this cake but know with gluten free floor you usually need to make a wetter mixture so maybe you’d need a little less flour but I find it’s trial and error depending on recipe and floor. Hi Helen, thanks so much, I actually want to try experimenting with gluten free flour so thank you for the advice. Have a great weekend. Hi Siddiqa, thanks so much and so glad everyone enjoyed it. Have a great week. This is probably the best cake I have ever made. I did not have any oil so used butter. Also I used SR flour still added the baking powder. No fresh lemons had commercial lemon juice in fridge substituted with this. Held my breath and it turned out perfect. Thank you so much. Hi Karen, thanks so much, so glad you enjoyed it. It’s one of our favourites too. Have a wonderful Sunday. Thank you for this recipe! Anxious to try it! Does this cake freeze successfully? Hi KK Thanks so much, I have never frozen it but I am sure you could. First wrap it in plastic wrap then wrap it again in foil or place it in a zip loc bag, be sure to remove any air in the bag. Hope this helps. I made this cake last night to bring to my son’s family. Like me they love anything lemonly! It turned out great! I personally found it a bit too sweet, but that’s just me! I will definitely make it again! I was wondering, would I be able to double the recipe and put it into a large bundt pan, rather than my 8 inch square pan? Thanks for the easy directions and lovely pictures! Hi Luisa, thanks, so glad everyone enjoyed it. I have never doubled it but I don’t see why not. Let me know how it goes. i was so excited to try this cake based on the simplicity and your picture of the finished product. I was disappointed with the results, i used the exact size pan and it looked like a pancake, i made sure to beat the eggs and sugar for over 5 minutes as suggested. Hi Josie, sorry it didn’t work out. I have made this recipe at least 5 times before and after posting and I made a video. I am thinking that it could be your oven temperature is off or your baking powder has gone bad. Let me know. Delicious tasting but the cake came out nearly as flat as a pancake even after mixing it for 5 minutes with a stand mixer. I used a bundt pan that measured 8.5 inches across the bottom, but it was probably too large. Hi Caroline, yes your bundt pan was too big, this is a small cake so a 7 1/2 inch bundt pan is perfect. Hi Patricia, your welcome and thanks so much and so glad you enjoyed it, have a wonderful Sunday. Hi Theresa, yes it’s the beating of the egg and sugar that makes the difference. Glad you enjoyed it though. Have a great weekend. Is there anything that I can use to replace milk? Hi Miriam, a friend of mine actually uses water and says it works fine, so you could try that. Let me know how it goes. Made this cake today. Realized my pan was too big. The cake is a little short. But taste great! Thanks so much for sharing. Hi Laura, thanks so much, a little short is ok as long as it tastes great! Have a great week. I just made it. Instead of using one teaspoon of baking powder I used 1 tablespoon,the eggs never came out fluffy but I beat them for 5 minutes on medium speed and 5 minutes in high and just plain liquid mixture I used brown sugar. Hi Meelany, thanks so much, so glad you enjoyed it. I love limes so I am sure it would be amazing. I think the key is to beat the eggs and sugar for at least 5 minutes. I just finished a video. Posting today. Have a great weekend. Made it 2x’s… used 1 tbs lemon extract and no rind or fresh lemon juice… came out amazing! Most best eggs and sugar until very fluffy, almost like a meringue! Hi Joann, so glad you enjoyed it, I think that is exactly the reason it works, beating until light and fluffy. Have a great weekend. Hi Reem so glad to hear that, it has worked for me, in fact I made it a few times just to be sure, so I have no idea why it isn’t working for others. Have a great weekend. What pan do you use for this cake? 7in bundt pans seem to vary in cup size. Thank you. Hi Jillyanne, I used the small bundt pan from William Sonoma (not the individual pan) and it says 6 cup size. Hope that helps. Interesting….did you use the lemon juice as well? Did you up the dry ingredients or lessen the wet ingredients to make the same science of the batter? I noticed that lemons we picked Fromm trees in Italy were much more “lemony” with a sourer & stronger taste. I’m wondering if this might affect the cake’s taste ? I am happy to find you blog since I love Italy and the time I’ve been able to spend there. Hi. This cake looks amazing, but it came out short and super dense when I made it! What might I have done wrong? Hi Kim, did you check the temperature of your oven? Or was the cake pan too big? Did you maybe not beat it enough at the beginning? Let me know. There is almost as much oil as flour. Should have caught that. How much longer did you bake it for when Doubling the recipe? Hi Christi I would say bake for about 50 minutes and then start testing with a toothpick. Hope that helps. Darlene, did you use a single batch of batter or did you increase the amount for your ten-inch pan? My pan is also a ten-inch and I am reluctant to purchase another but really want to try this recipe. Dear Amy the look and texture of my cake is great however the lemon taste is very mild. May be next time I will add a drop of lemon oil to it. Hi Azita I guess it just depends on how much lemon you like and how strong, so adding a drop of lemon oil is a great idea. Your Recipe looks delicious , can’t wait to try it! Just checking is it 1 teaspoon of baking powder or 1 tablespoon (since its a tablespoon recipe) , thanks!! I love your cake recipes and try quite a few of the simpler ones. I made the Italian lemon cake in an 8 inch bundt pan and while it looked beautiful as I was pulling it out of the oven, it sunk in the middle while cooling. The outer edges were a little brown but the rest of the cake was golden. It cooked 50 minutes at 350 degrees. What did I do wrong? Hi Paola, thank you, I found these are helpful so that the cake doesn’t fall, you could be beating too long or at too high a speed (no higher than medium) and when you add the flour lower the speed and combine gently. At a higher speed you develop too much gluten in the flour which can cause the cake to fall once baked. You could also try using room temperature ingredients, make sure your baking powder hasn’t expired and also check your oven temperature to make sure it is reading properly. Hope this helps. Let me know how it goes. I made this yesterday, followed it exactly…my batter looked just like the picture. Except it came out more than half the size of the one pictured. Anyone else have this issue? Hi Ashley, do you mean less than half the size? If so I think you used too big of a cake pan. Let me know. Yes, and I’m the biggest ding dong! And never realized it until you just said it. I pulled out my two bundt pans and must have grabbed the bigger one! Definitely making it again in the correct pan! HOWEVER…1 inch high (lol) it still tastes great!! A limb for this cake again!! Hi Fran, I am so sorry about the result, I am not in Italy at the moment but the second I get back I am remaking this cake and I am going to figure out why this is happening. I made it 3 times and it worked, thanks for letting me know. I am a huge lemon lover! Lemon cookies, lemon vinaigrette’s, lemon cakes, lemon ice cream, lemony linguine, …..you name it and I’ll try it. I will definitely have to try out this Tablespoon……cute name….cake! Have a nice day Rosemary! Hi Dalila thanks so much and haha just like me, I can’t get enough of lemons. Have a great day! Are these level tablespoons or heaping? Hi Joy yes they are level tablespoons. Hi Rosemary, What a delicious looking cake! Are the Tablespoons level ones? Hi Mary, you can substitute the milk with water or you could leave out the zest and lemon juice and substitute with 12 tablespoons of fruit juice. Hope that helps. This looks like one of the best lemon cakes I’ve ever had! Not too difficult to make, and so delicious when it’s done. Thanks Nellie, I hope you enjoy it! This is such a fun cake concept! 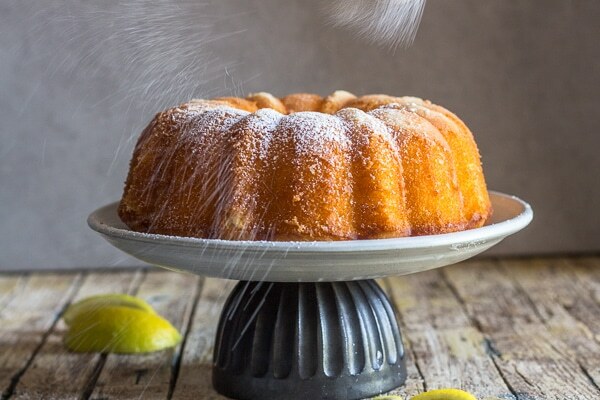 I love lemon desserts and I think that going without frosting and just dusting with powdered sugar on this one is a smart choice because it allows the beauty of the lemon cake crumb to show through without the flashier frosting getting in the way! Hi Amy, thanks and yes I agree, this way you really taste the lemon flavour.